Are you Thinking in 3D? 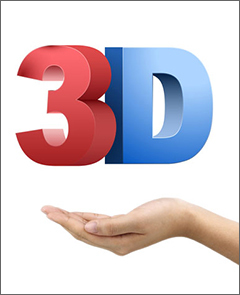 It has become a mantra of mine that the best businesses think in 3D. They’re ‘Dramatically and Demonstrably Different‘ from their competitors. They do things that their competitors don’t do. Even better, they do things they can’t do. Being ‘dramatically and demonstrably different’ doesn’t have to be complicated, but it does take a little thought and imagination. That’s particularly true in industries such as professional services that are full of similar companies employing similar people, marketing similar services in a similar way. It’s not just lawyers who are guilty of ‘group-think’. Why do all accountants seem to send out the same little explanatory booklets after each budget? And while we’re at it, why do most banks and financial services businesses employ the same (dreary) copywriters and the majority of car dealerships and electrical retailers seem to recruit from the same pool of mediocre talent? Yet most of these firms will still try to insist that they are somehow ‘different’ from their competitors. Some may well be. But unless they do something their competitors aren’t or can’t do, or even better, do things their customers don’t expect either, their talk is just that – all talk. I love seeing businesses that dare to go against the grain, do the unexpected and break the rules – businesses that are revolutionary. But it doesn’t have to be earth-shattering. Sometimes it’s the little things that do it. Take those little booklets sent out by accountancy firms. After the last budget, I asked half a dozen business associates about them. Five firms sent the booklet – the same booklet with a different cover – and nothing else. One firm sent four copies with the same standard letter to the same person. Three firms sent a booklet with a blank compliment slip. Another two sent compliment slips with an undecipherable signature at the bottom and two more sent a booklet with a standard cover letter. But one friend received a booklet together with a personal, hand-written note from his accountant explaining three key points that would impact him and his business personally. Now, that was different. More work, yes, more effort, yes, but much greater IMPACT! I came across one accountancy firm that washed your car when you parked in their car park. A design business I know doesn’t send hampers or bottles of whiskey at Christmas, but buys key clients an annual subscription to a magazine or website that interests them. Take this a stage further and you get firms that have managed to build ‘dramatic difference’ into their business model. Build-a-Bear, for example, don’t just sell soft toys, they sell personal experiences and help customers create a bear no other shop could ever sell. Innocent Drinks built their business on quality ingredients packaged with a fantastic irreverence that the likes of Coke and Pepsi couldn’t touch. And Malmaison Hotels publicly declare that they dare to be different through their décor, facilities, service and little touches. There are no ‘do not disturb’ signs here, instead they say ‘I want to be alone’! All this takes is some imagination, courage and a willingness to break the mould. If you always talk to the same people, read the same newspapers and magazines, visit the same websites and focus on the same businesses when trying to ‘get ahead’, the likelihood is that you’ll get the same outcomes. To break that habit, try fishing in different ponds. Why not do something different and see how other people, businesses, industries, countries, even cultures, do stuff to differentiate themselves? So is your business dramatically different or are you simply the same as all the others? GO on, do something that nobody would expect you to do. Stick your neck out. It might just get you ahead.